Tatev Monastery Complex is located in the south of Armenia, 250 km from Yerevan and Wings of Tatev Halidzor station is 235 km from the capital. From the latter one can reach to Tatev Monastery Complex by road or by the tramway, but it’s important to know that the bigger part of this road is incomplete and may bring some wearout to your vehicle. Getting from Yerevan to the region (the trip may take from 3.5 to 4 hours) is possible by a taxi, by using transfers provided by tour operators (generally 5000-7000 AMD per person), renting an automobile, or by taking a route taxi (marshrutka) or a shared taxi to Goris and taking another taxi directly to Tatev from there, the prices of the latter part of the trip may vary from 6,000 to 10,000 AMD per taxi. There are a number of tour providers in Yerevan that provide taxi and bus service directly to the monastery and back, and also many local drivers who serve as shared taxis, and can take guests from Yerevan to Tatev Village or the Halidzor ropeway station. Tatev Information Center can be of assistance in planning your transportation to Tatev. The national currency of Armenia is the Armenian Dram (AMD). Payment in shops, stores, as well as other service provision points is only possible in AMD. US Dollars, Euro and Russian Rubles are widely used and can be easily exchanged (check the website of the Central Bank of Armenia for the most recent exchange rates). The number of ATMs in Yerevan is steadily growing and finding one nearby shouldn't be difficult. However, be careful to carry enough local currency with you when travelling outside the capital. Different money transfer systems (such as UNISTREAM, Anelik, Moneygram, Avers, etc.) operate in Armenia, and almost all banks can send and receive foreign currency abroad via the SWIFT network. Many local businesses (shops, restaurants and hotels) accept credit card payments – however, do not assume that all establishments will accept these and check beforehand. Immediately upon arrival in the customs control lobby at the airport. Visa cost is 7 euros. In foreign embassies of the Republic of Armenia. List of countries whose citizens may obtain a visa only provided possession of an invitation. For further information on visa policies and procedures visit the website of the Ministry of Foreign Affairs of the Republic of Armenia. 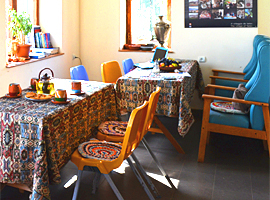 The Tatev Information Center was opened on July 7th, 2007 by the Arshakyan family, and has a mission of fostering economic development in Tatev Village by supporting local providers of touristic services and functioning as a link between the local community and the tourist population. 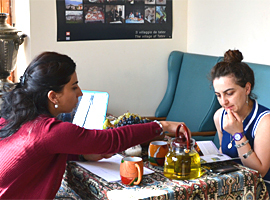 Since its opening, the Tatev Info Center has grown to include a souvenir shop and a cafe, and also functions as a meeting place for local groups like the Tatev Youth Center. The Info Center has free Wi-Fi, as well as great coffee, baked goods, and home-cooked meals. 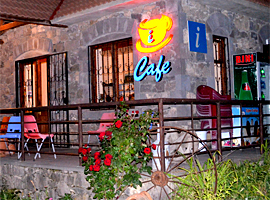 It is the perfect spot for travelers to meet and relax after making the long trek to the monastery, and has the resources and expertise necessary to help you plan both your stay in Tatev Village and the next leg of your journey in Armenia. 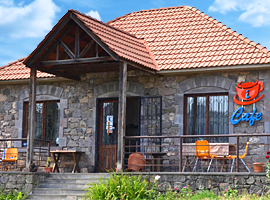 The Info Center is famous for its friendly, family atmosphere - the Arshakyan family practices true Armenian hospitality and will help to make your stay in Tatev unforgettable.